The sign for the new Southlands Village Green in Williams Road, Shoreham, was officially unveiled on Monday. 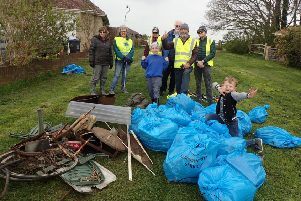 Residents joined Ann Martin, Southlanders Community Group chairman, and Paul Graysmark, Adur district councillor for Southlands Ward, for the occasion. The aim of obtaining village green status for the patch of grass was to protect it from property development. The Southlanders are now raising money for a seat.